On this day, seven years ago, Blessed Pope John Paul II went home. I was a senior in high school back then. Thanks to being involved in my youth group and learning more about Pope John Paul II, I started gaining more and more appreciation for the man and the office of the papacy. But to be honest, while I did know some things and learned a little more about him in high school, I didn’t know enough to fully grasp him and his life and ministry. But that didn’t matter. I still wept. The idea of being without a fearless leader who I knew to be very awesome was…kind of frightening, and hearing about his passing even though I didn’t know a lot about him still made me quite sad. And I wept because it makes me sad to see other people sad and crying too in addition to my own feelings. And I was in a Catholic school gym at the time with hundreds of other Catholic youth, mostly from the diocese, were also in that saddened state. Blessed Pope John Paul II passed away while I was on a Youth 2000 retreat. All week prior to the retreat, we heard stories of the Pope’s declining health, and the Franciscan Friars of the Renewal running the retreat made sure for us to offer up prayers for the Pope. I remember at the beginning of the retreat, we all had that uncertainty. I remember distinctly when we received word of his passing. It was Saturday afternoon of the retreat. Father I-Forget-His-Name paused the retreat in order to break the news. And I wouldn’t say there was wailing and emptying of tissue boxes but the general vibe was definitely a sort of profound sadness. But I know our sadness was not in vain. How can it, when Jesus was right there exposed in the monstrance? We took a little while to just pause and pray for the repose of his soul and for the Church. Then we resumed the retreat. Anyway, looking back and I can’t think of a better place or time to receive the news of Blessed Pope John Paul II’s passing. Right there with Jesus and my fellow brothers and sisters in Christ. Beautiful. Even though he longer walks upon this earth, the fruits of his labor continue today. I feel like there’s this renewed sense of enthusiasm and desire of orthodoxy within the Church that wouldn’t have been there had he not shepherded his flock in the right direction while he was Pope. Truly, his work and leadership will continue to benefit the Church for generations to come. And his intercessions in our prayers will be fruitful as well. 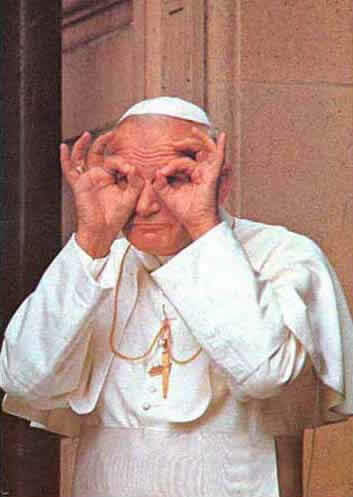 Anyway, Blessed Pope John Paul II…PRAY FOR US! Faith. Hope. Charity. Pope is dope.